We have our Main House in front and towards the back the 800 sq-ft Studio and Lanai facing East, with a direct view onto our garden and fruit tree orchard. Our orchard contains various seasonal fruits like papayas, starfruit, lychee, Jabuticaba, and more. This house is now 30 years owned by the family. It is passed on through the generations of the house owners family. The house itself is an old Plantation house style building. This means it is the old style they builded houses here on the island 50 years ago. In the last year the house underwent major renovations and rebuilding to make it much nicer and also a little bid bigger. The location is a nice, secure and quiet neighborhood on the golf driving range. That makes this house and location as a vacation rental quite unique. We fell in love with the nice, big and airy studio. The view from its patio out over the yard, the golf course, and out the ocean. We provide 2 sets of Golf clubs. One for men and one for women. The Studio has a Recliner and a Loveseat. We have spent a month in the Hilo area each of the last five years. We enjoyed staying here in this very clean, spacious, comfortable large studio unit very much.. The location suited us well. The unit is bright with an attractive garden view,has a great lanai (balcony), and a golf course in the background. It is very well equipped with great kitchen, cable tv and excellent high speed internet. Very comfortable bed and on sunny mornings birdsong to wake up to! The road is quiet with little (and calmed) traffic yet it is conveniently located for access to groceries, zoo, snorkelling, hiking at Volcano NP and visiting the beautiful Hawaiian tropical gardens.The family are very friendly and thoughtful, but not intrusive-They generously shared fruit from their garden..(we tried sour-sop for the first time ) and have 2 active children we enjoyed meeting. We would definitely return on our next trip! You can enjoy a cool, fresh breeze blowing through this large studio apartment which has windows on both sides and a slider on another side making for great ventilation. It was located in a quiet neighborhood convenient to Hilo, with the only sounds being the filling buckets of golf balls on the neighboring driving range and the kids playing in the nearby yards. The apartment had everything that we needed, including covered parking. The home was well furnished with a comfortable bed and was very clean. We could even see a little of the ocean from the lanai. Ingrid and Amon were great hosts who shared their knowledge of the island. Amon shared his mutual love of fruit, sharing fruits that were in season such as wonderful chocolate sapote. Beautiful and Spacious study apartment! Hostess Ingrid is the best! Warm welcome and friendly arrival greeting. Also again at checkout warm friendly and waving goodbye. I was truly amazed and highly recommend this apartment to everyone! We enjoyed the view of the golf course and the sunrises and awesome view of Mauna Kea from the second story lanai. The kitchen was fully furnished and comfortable sleeping accommodations. All the windows opened allowed a constant breeze of fresh air. 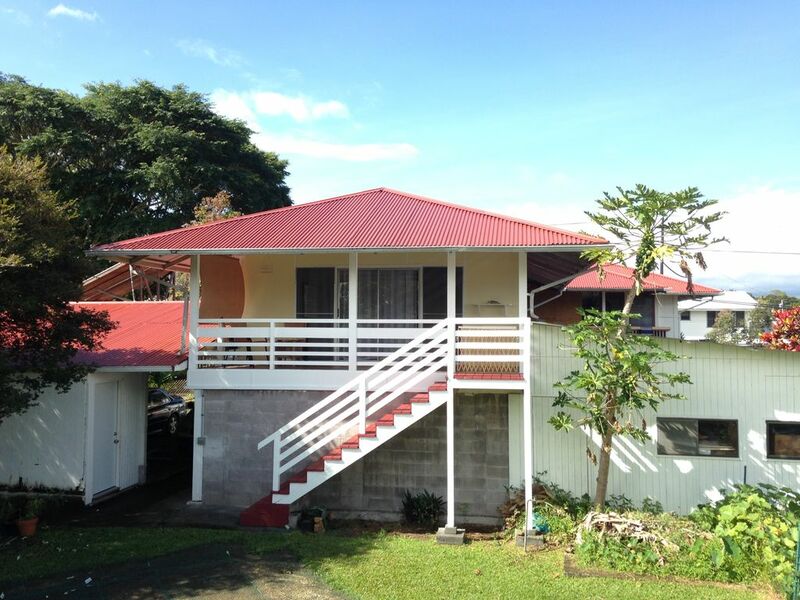 This large studio apartment was located in a great quiet neighborhood convenient to Hilo. The apartment had everything that we needed, including covered parking (a blessing when it rained). The home was well furnished with a comfortable bed and was very clean. We even had a glimpse of the ocean when the sky was clear, which was unexpected. Ingrid and Amon were great hosts who shared their knowledge of the island when asked. We were also able to enjoy the fresh fruit grown in the back yard. We will return to this rental the next time we come to Hilo and we definitely found new Hawaii friends. Thanks so much for your hospitality. We ask for 50% deposit and balance due upon arrival. Deposit is required to pay by Paypal or with a check. Balance can be payed with Cash, Check or by PayPal.